This family has long enjoyed hibiscus tea on hot summer days but having grown up in a largely-Hispanic part of California, we don’t call it “hibiscus,” we call it by its Spanish name, “jamaica.” Though spelled like the island country of Jamaica, it is actually pronounced “Ha-Mike-Ah” in Spanish. It is a striking deep red tone, adding to the flavor experience. That same red tone can add to your wardrobe experience too, perhaps staining your clothes in ways you did not intend. My children drink it in a lidded cup. Some years back I had cause to buy hibiscus in a regular grocery store in a bulk bin, causing the checker all kinds of trouble in finding the correct code. I kept saying, “That’s hibiscus, or maybe listed as jamaica.” She fumbled around and charged me for yucca. A few days later I grabbed some hibiscus at a Mexican market from the bulk bin and put it in one of those plastic produce bags, unmarked. I was ready to tell the checker “that’s jamaica” but she was quicker than I. She reached for the produce bag, gave it the slightest side glance, pulled it through the register with her left hand and with her right hand typed in the code for “jamaica.” As I said, Mexicans know jamaica very well. She knew it with a glance and a touch. In fact, I’ve found that the biggest difference here in our local markets between hibiscus and “jamaica” is about four dollars a pound. Gringos like me (white people) buy hibiscus in health food stores. Mexicans buy it in Mexican markets. Hibiscus plants are prolific in Mexico and don’t need to be sprayed with chemicals to be productive. I expect any pesticide residue is little to none in either case. I save four dollars a pound regularly. We have loved hibiscus tea for the flavor and have enjoyed it for years in our household, but the new promising research on hibiscus (along with a history of traditional use) has our attention and makes us think we need to enjoy it much more regularly. We are all told to “eat more vegetables” to improve our heart health and, of course, there are many reasons to eat more vegetables. However, for similar reasons, perhaps we should also be told to “drink more hibiscus” tea because it is loaded with many of those same properties of the vegetable world that are heart-protective. It also has the benefits of being easy to prepare and of being fairly inexpensive. 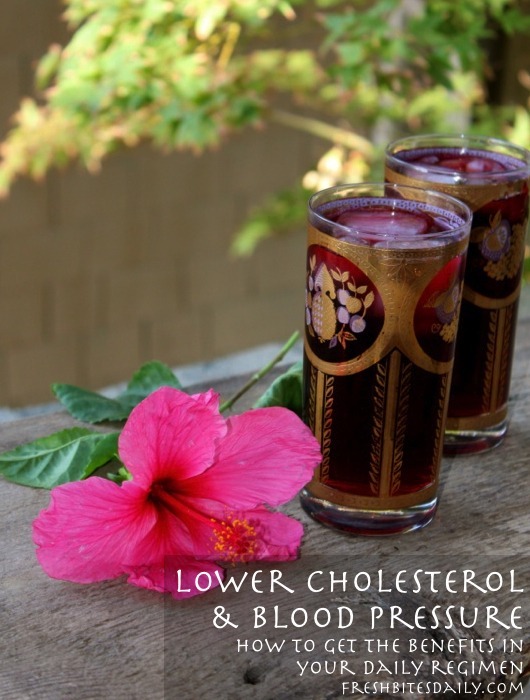 Indeed, hibiscus may both lower blood pressure and cholesterol and has the potential, especially for those of us who haven’t progressed to higher, doctor-concerning levels to be a great tool in protecting our heart health. There are a number of interesting studies on the topic that suggest hibiscus may help control blood pressure (Mozaffari-Khosravi et al. 2008; ) and lower cholesterol levels (Lin et al. 2007; Mozaffari-Khosravi et al. 2009; Hirunpanich 2006). This area of research is quite young but it is augmented by the traditional use of hibiscus in Mexico, West Africa, and throughout Asia (India, Tawian, Thailand, Iraq) for these very purposes. Given that hibiscus has no significant side effects (though read the safety information below) and it is extremely cheap and easy to implement, I have hibiscus tea in my refrigerator right now just as a heart-health protection tool for the whole family. How much do we drink to protect our heart? This is where the academic research is quite useful. 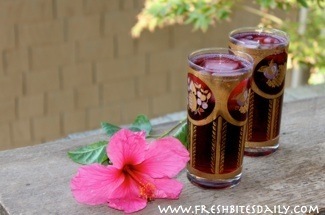 A 2010 study provides us with a specific daily hibiscus regimen that is easily implemented at home. The results of the study were quite promising. In traditional uses of hibiscus, the amount of hibiscus that different cultures used varied across region and surely across households within them, with families making adjustments to suit their tastes. You can vary yours too. In Mexican preparations of hibiscus (which I am most familiar with) the ratio of hibiscus flower to water is quite strong, far stronger than in the study I cite here. It is a full-flavored tea that could actually surprise you in its density. There is no reason not to use this traditional Mexican approach though do read the safety and drug section below. As for the 2010 study, the researchers were kind to us and had participants brew tea from actual commercially-available tea bags (which you can find here from our Amazon partner). The tea bags contained 1.25 grams of hibiscus, an amount commonly found in commercial hibiscus tea bags. People simply placed the tea bag in a cup and covered it with 8 ounces of boiling water for six minutes. They removed the tea bag and drank their tea. That’s it. It is a whole like a regular tea regimen because, in fact, it is. The researchers did allow participants to prepare their tea for a day in one batch but asked that they consume it in 12 hours. They did not want spoilage factors introduced into their study and if you are on a strict regimen you probably do not want to hold your tea for more than a couple of days (and if you do make bulk batches at all, certainly store it in the refrigerator). It is also worth noting that the study included patients with mild hypertension and what they considered to be pre-hypertensive. In the study group, the systolic blood pressure decreased about 7 points. While not an earth-shattering change, it is a real change from an extremely simple regimen and, the fact is, the hibiscus may have a greater effect on you than on the average person in the study. It is certainly worth a try and is a regimen that is basically a “no lose” situation. If you find yourself relying on a traditional herbal remedy to improve your health, work with a medical provider to examine any potential risks or side effects for your unique case. The hibiscus flower is consumed globally as a tea and the risks of consuming large amounts of it appear to relate to drug interactions. Hibiscus can be a mild diuretic. In a 2013 review, Hopkins and colleagues warn against consuming hibiscus while taking the common diuretic drug hydrochlorothiazide. Acetaminophen may be less effective when consumed with hibiscus (Hopkins et al. 2013). In our house we use it as a refreshing base for ice tea in the summer and as a great immune-boosting base in the winter. Throughout the winter, I always have a pot with sliced ginger and turmeric as an ever-ready tea but I do like to add a bit more flavor to it. The winter seems awfully long otherwise. My two go-to flavor options are elderberry and hibiscus, both which support a strong immune system and add nice flavor to my ginger/turmeric brew. 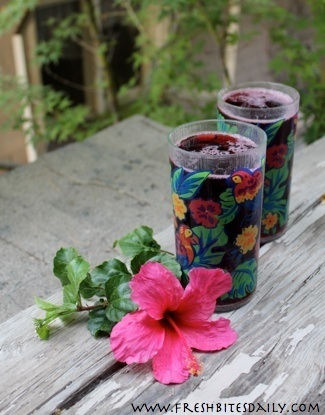 If you hope to add hibiscus tea to your regimen regularly, develop a system of making a large batch of a strong infusion and keeping it in the refrigerator, perhaps like the hibiscus syrup I describe here. You could eliminate the sugar altogether and just keep a very strong infusion in your refrigerator to add to a cup of warm water. You can find hibiscus at any Mexican market (look for “jamaica”) and at some health food stores that have a bulk herb section. For online purchases, we recommend our favorite vendor here who sells good quality product. If you are looking for a turn-key tea bag approach, this one from our Amazon partner will do (here). During the summer I also keep a hibiscus syrup around for simple cold hibiscus beverages, basically as I describe here. A syrup is a great convenience tool and takes much less space in your refrigerator than a tea. Hirunpanich, V., Utaipat, A., Morales, N. P., Bunyapraphatsara, N., Sato, H., Herunsale, A., & Suthisisang, C. (2006). Hypocholesterolemic and antioxidant effects of aqueous extracts from the dried calyx of< i> Hibiscus sabdariffa L. in hypercholesterolemic rats. Journal of ethnopharmacology, 103(2), 252-260. Hopkins, A. L., Lamm, M. G., Funk, J. L., & Ritenbaugh, C. (2013). < i> Hibiscus sabdariffa L. in the treatment of hypertension and hyperlipidemia: A comprehensive review of animal and human studies. Fitoterapia, 85, 84-94. McKay, D. L., Chen, C. O., Saltzman, E., & Blumberg, J. B. (2010). 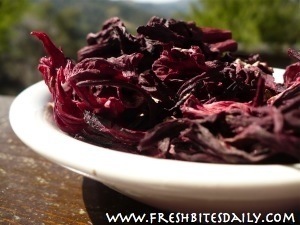 Hibiscus sabdariffa L. tea (tisane) lowers blood pressure in prehypertensive and mildly hypertensive adults. The Journal of nutrition, 140(2), 298-303. Mozaffari-Khosravi, H., Jalali-Khanabadi, B. A., Afkhami-Ardekani, M., Fatehi, F., & Noori-Shadkam, M. (2008). The effects of sour tea (Hibiscus sabdariffa) on hypertension in patients with type II diabetes. Journal of human hypertension, 23(1), 48-54. Mozaffari-Khosravi, H., Jalali-Khanabadi, B. A., Afkhami-Ardekani, M., & Fatehi, F. (2009). Effects of sour tea (Hibiscus sabdariffa) on lipid profile and lipoproteins in patients with type II diabetes. The Journal of Alternative and Complementary Medicine, 15(8), 899-903.